The Navy's fourth nuclear-powered carrier is named for the late congressman from the great State of Georgia. The keel for the "Starship Vinson" was laid on 11 October 1975, launched on 15 March 1980, and commissioned on 13 March 1982. Her home-port is Puget Sound Naval Shipyard in Bremerton, WA. She deployed late 1998 on a WestPac/ Arabian Gulf cruise, and returned in May of 1999 to her home-port. The Navy's fourth nuclear-powered carrier is named for the late congressman from the great State of Georgia. The keel for the "Starship Vinson" was laid on 11 October 1975, launched on 15 March 1980, and commissioned on 13 March 1982. Her home-port is Puget Sound Naval Shipyard in Bremerton, WA. She deployed late 1998 on a WestPac/Arabian Gulf cruise, and returned in May of 1999 to her home-port. The fourth Nimitz-class carrier is named for the 26th President, former Secretary of the Navy, and leader of the "Rough Riders". The carrier's keel was laid on 31 October 1981, just eight months after similarly named Fleet Ballistic Missile Submarine (SSBN) 600 was decommissioned. The carrier was commissioned 25 October 1986 at NAS Norfolk, VA which is her home-port. The keel for the carrier named in honor of America's 16th President was laid on 3 November 1984, launched on 13 February 1988, and commissioned on 11 November 1989. Previously, the Fleet Ballistic Missile Submarine (SSBN) 602 carried the name. She deployed on a WestPac/Arabian Gulf deployment on 11 June 1998 for her regularly scheduled rotation, then returned on 7 December 1998 to her home port of Everett, WA. 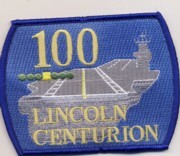 This is a current Centurion patch for the USS Abraham Lincoln. This is a current 200 traps patch for the USS Abraham Lincoln. The keel for the carrier named in honor of America's 16th President was laid on 3 November 1984, launched on 13 February 1988, and commissioned on 11 November 1989. Previously, the Fleet Ballistic Missile Submarine (SSBN) 602 carried the name. She deployed on a WestPac/Arabian Gulf deployment on 11 June 1998 for her regularly scheduled rotation, then returned on 7 December 1998 to her home port of Everett, WA. This is the "200 Traps" (Double Centurion) patch created for those flyers attached to her. 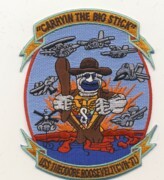 This is the Division patch for the Weapons/Security division onboard the USS Lincoln for the WestPac 2002 Cruise. The "GW" was commissioned on 04 July 1992 and has served the Atlantic Fleet during her tenure. She is named after the founding father and carries the nickname "The Spirit of Freedom". 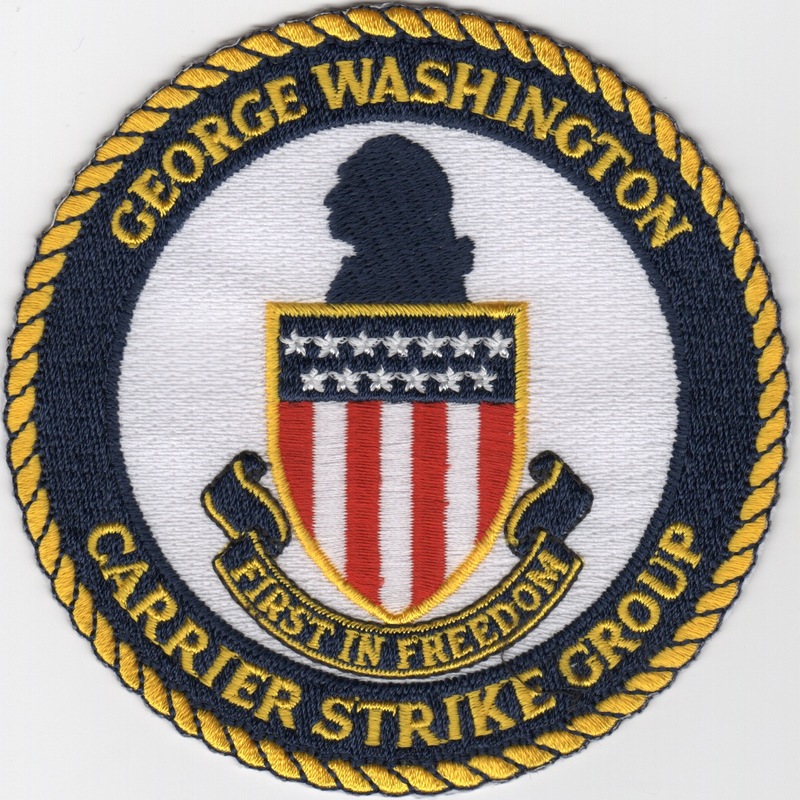 This patch is for the new designation, the "Carrier Strike Group". The keel for the ship named for the "Father of America's modern Navy", an eight-term senator from the great State of Mississippi, was laid on 13 March 1991, launched on 13 November 1993, and commissioned on 11 November 1995. The Stennis departed NAS Norfolk in February 1998 on it's inaugural cruise with CVW-7 aboard, subsequently completed a World Cruise, and sailed to her new home-port at San Diego, CA in August 1998. She bid farewell to CVW-7 and welcomed aboard CVW-9. The keel for the ship named for the "Father of America's modern Navy", an eight-term senator from the great State of Mississippi, was laid on 13 March 1991, launched on 13 November 1993, and commissioned on 11 November 1995. The Stennis departed NAS Norfolk in February 1998 on it's inaugural cruise with CVW-7 aboard, subsequently completed a World Cruise, and sailed to her new home-port at San Diego, CA in August 1998. She bid farewell to CVW-7 and welcomed aboard CVW-9. This is the 100-nights trap patch for those pilots/Navigators that have landed on her at night 100 times or more. This is the newest of America's nuclear fleet, the Harry S. Truman, and this is their Aircraft Intermediate Maintenance Department patch. They are the guys on the ship who handle all the "mid-level" maintenance on the aircraft. This is the one of the newest of America's nuclear fleet, the Harry S. Truman, who is famous for his quote, "The buck stops here". That's the motto of this great ship and she's one of the largest we have. Talk about Power of Projection.....This is the 100 Centurion patch denoting 100 landings aboard her. It also says "GIVE 'EM HELL" along the top. This is the one of the newest of America's nuclear fleet, the Harry S. Truman, who is famous for his quote, "The buck stops here". That's the motto of this great ship and she's one of the largest we have. Talk about Power of Projection.....This is the 200 Centurion patch denoting 200 landings aboard her. It also says "GIVE 'EM HELL" along the top. This is the one of the newest of America's nuclear fleet, the Harry S. Truman, who is famous for his quote, "The buck stops here". That's the motto of this great ship and she's one of the largest we have. Talk about Power of Projection.....This is the 300 Centurion patch denoting 300 landings aboard her. It also says "GIVE 'EM HELL" along the top. This is the one of the newest of America's nuclear fleet, the Harry S. Truman, who is famous for his quote, "The buck stops here". That's the motto of this great ship and she's one of the largest we have. Talk about Power of Projection.....This is the 400 Centurion patch denoting 400 landings aboard her. It also says "GIVE 'EM HELL" along the top. This is the one of the newest of America's nuclear fleet, the Harry S. Truman, who is famous for his quote, "The buck stops here". That's the motto of this great ship and she's one of the largest we have. Talk about Power of Projection.....This is the 500 Centurion patch denoting 500 landings aboard her. It also says "GIVE 'EM HELL" along the top. This is the small version of the USS Ronald Reagan aircraft carrier patch. He was one of the greatest pro-military presidents the U.S. ever had. He was a staunch supporter of the 600-ship Navy. This patch does NOT come with velcro. 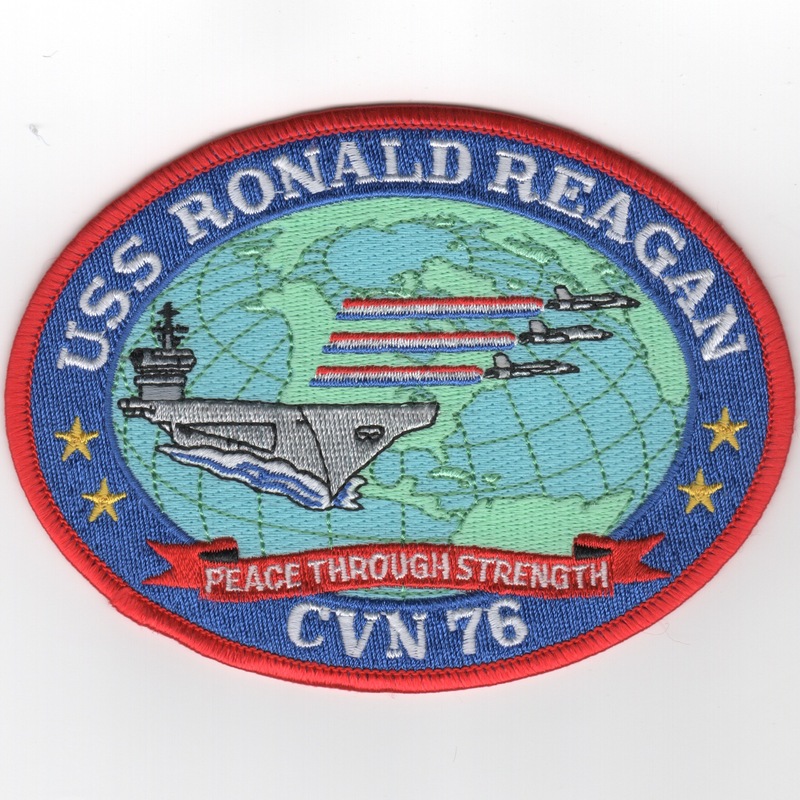 This is the medium-sized version of the USS Ronald Reagan aircraft carrier patch. He was one of the greatest pro-military presidents the U.S. ever had. He was a staunch supporter of the 600-ship Navy. This patch does NOT come with velcro. This is THE newest of America's nuclear fleet, the George H. W. Bush. I believe it is out of Newport News. This is THE newest of America's nuclear fleet, the George H. W. Bush. I believe it is out of Newport News. I'm pretty sure this is the Northrop Grumman issue patch. This is the LSO patch worn only by Atlantic Fleet (AirLant) LSO's. The blue shield is still in use and is the most popular and wide-spread patch worn by ALL the LSO's. This is the (old) historical patch for the Landing Signal Officer school located at NAS Oceana, VA. All LSOs came through this school before being certified for duty on the boat. This is the previous style of the patch for the Landing Signal Officer school located at NAS Oceana, VA. All LSOs come through this school before being certified for duty on the boat. This version is fully embroidered. This is the previous style of the patch for the Landing Signal Officer school located at NAS Oceana, VA. All LSOs come through this school before being certified for duty on the boat. This version is partially embroidered, showing some of the background. I think this is the older of the 2 versions. This is the 1960s era Landing Signal Officer (LSO) patch. 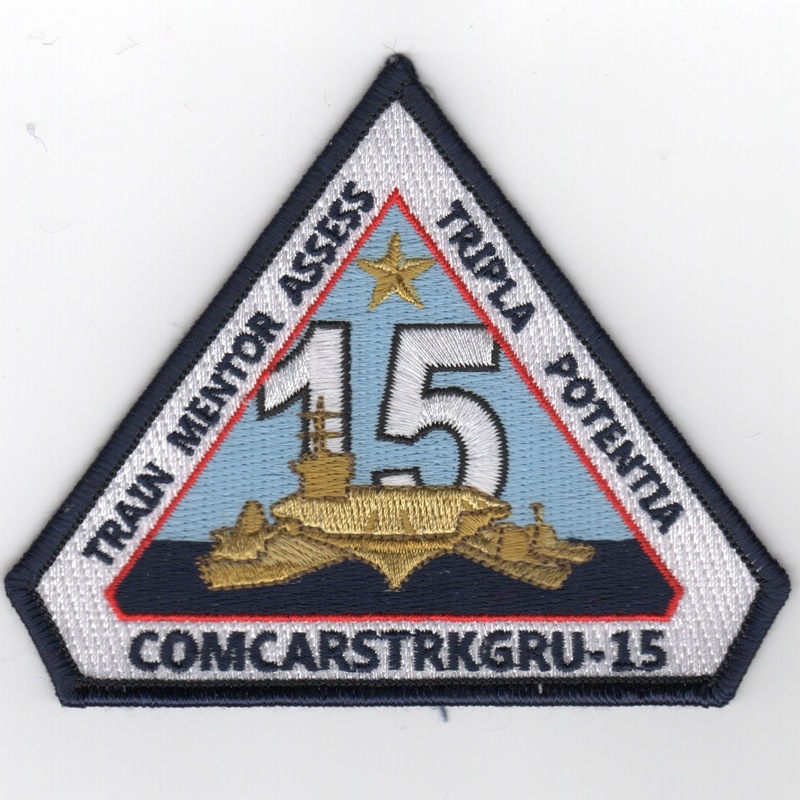 Carrier Strike Group Fifteen, abbreviated CSG-15 or CARSTRKGRU 15, the U.S. Fleet Forces Command formation charged with training and certifying Pacific Fleet Carrier Strike Groups, Amphibious Ready Groups, and independently deploying surface ships, replacing Strike Force Training Pacific. Previously, CSG-15 was one of fourteen U.S. Navy carrier strike groups established on 1 October 2004. U.S. Navy carrier strike groups are employed in a variety of roles, all of which involve gaining and maintaining sea control. Before 1 October 2004, the group was known as Cruiser-Destroyer Group 1. The group commander served as Immediate Superior-in-Command (ISIC) for the ships and units assigned to Carrier Strike Group Fifteen. As an Operational Commander, the group commander exercised oversight of training, integrated training, and readiness, as well as maintaining administrative functions and material readiness tracking for ships and squadrons assigned to the group. Carrier Strike Group Fifteen was initially based at Naval Station Norfolk, Virginia, prior to changing its homeport to Naval Air Station North Island, California, with the Nimitz-class nuclear-powered aircraft carrier USS�Ronald Reagan�(CVN-76) assigned as its flagship. Homepage | Order USN Aircraft Carrier Patches!